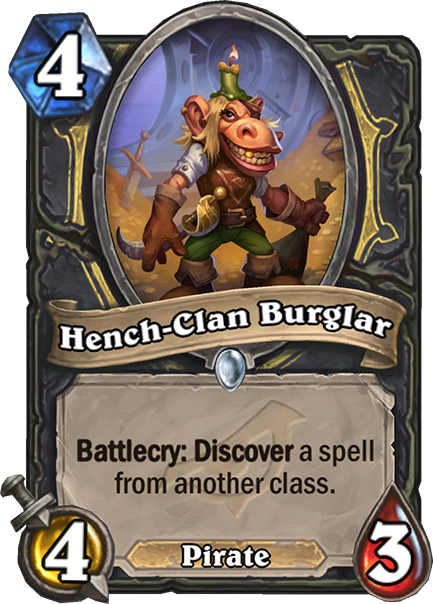 Hench-Clan Burglar is a 4 Mana Cost Common Rogue Minion Pirate card from the Rise of Shadows set! 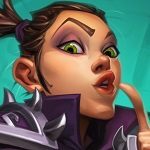 Battlecry: Discover a spell from another class. She’s more of a rat burglar. Rating: 4.0/5. From 252 votes. Its an okay card. But that’s the problem. It has nothing obviously unfair or powerful about it. Pick it in arena when you see it, otherwise it probably will only see a very small amount of play in constructed. 2 Stars as a card that sees small amounts of play. 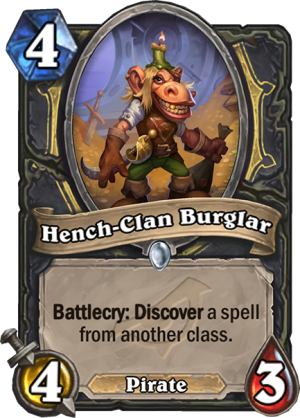 Hench-Clan Burglar is not outright better than Blink Fox, and it really isn’t even that aggressive. Maybe it’ll find a place in Thief Rogue, a deck that will forever be pining for format relevance and never getting it, but nothing else without at least one extra health stat. It will appear in theif rogue due to the deck running Cutlass and Tess in a match up against another rogue 2-3 of your cards are basically worthless this allows at least 1-2 extra hits with Cutlass and gives Tess SOMETHING to do with it’s battlecry. I’ve played theif rogue and I usually just concede right out because part of the strategy of theif is the Cutlass and without a different class you can’t restore durability. Spectral Cutlass decks were already starting to include Pirate packages for Raiding Party. This fits perfectly, so if that deck begins to thrive, this will surely see play. The wider the discover, the more inconsistent it will be, and there are a lot of stinkers across the other 8 classes. However, the pirate tag may be enough for this card to see play, since it may have a place in Hooktusk and Raiding Party decks. Cautiously optimistic for now. You can still use Blink fox if you want, though. Definitely an auto include for any Tess deck to deal with mirror matches I played a theif rogue and all I did whenever faced another rogue was auto concede the Cutlass was worthless unless you had face collector which gave chances at Legos from other classes won 2 games that way. Seems solid. A guaranteed card for Tess/Burgle Rogue, and a good standby if you’re a value-minded deck but still wanna play Raiding Party. Dunno if it’ll find a home in a meta deck but worth considering if you’re scraping together a Rogue deck. This is not the typical burgle effect though. It says spel lfrom another class not from your oponents class. So this is guaranteed a non rogue card in tess mirrors. Much like tomb pillager but a bit more fast while it does not give you a coin it can give you something usefull. Well as for how much the coin is worth is is not that valueless in rogue. 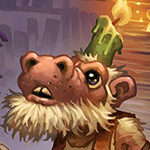 So i don’t think that the deck that run tomb pillager will replace it for this. But it is verry good card. Theif rogue is something I think could work year of the dragon. Does this help? Maybe. Will this see play? Probably not.